Traditionally, software testing has been performed using proprietary, onpremises technology. Physical servers running multiple virtual machines (VMs) functioned as a hub from which devices, or nodes, were controlled. Now, the number of device types to be tested has skyrocketed, as have browser versions, and application types. Additionally, the DevOps approach to building better software faster has pushed QA teams to find new ways to automate testing and drive greater efficiency. When thinking about their testing grid, small and medium-sized businesses (SMBs) and enterprises alike are faced with a choice — continue to build and maintain on-premises testing, or subscribe to a cloud-based testing service. When we talk about on-premises or in-house testing infrastructure, we mean infrastructure that is set up, maintained, and scaled by your internal IT Ops team. It could be an in-house data center, or servers in the public cloud. Conversely, a cloud-based testing service is a vendor-tailored platform that enables functional testing of web and mobile apps without the need to purchase or maintain physical infrastructure. Choosing between an on-premises or cloud testing service is critical and affects how apps are built and shipped, it will also affect the company’s bottom line. 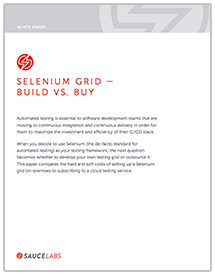 This paper assesses the infrastructure and maintenance costs of setting up a Selenium grid on-premises and subscribing to a cloud testing service in detail.